Your password to the Ascend software is encrypted, so we cannot look it up. However, your manager or administrator (usually the owner) can change your password for you. A user with the permission Users - Add, Edit, Remove can change a user's password. 2. Select Users in the left. 3. Double-click the user you'd like to edit. 4. Type a new password for the user in the Password field. 5. Retype the password in the Confirm Password field. That user can now log in using the new password. 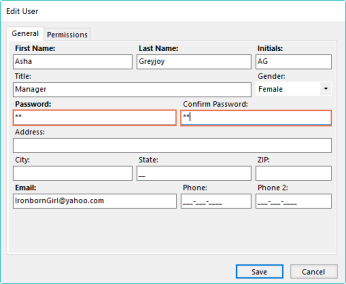 In the permissions area of a User profile, there are a few permission templates you can use. The Administrator template is the only user permissions template with the Users - Add, Edit, Remove permission. However, you can create custom permissions by checking or unchecking individual boxes.